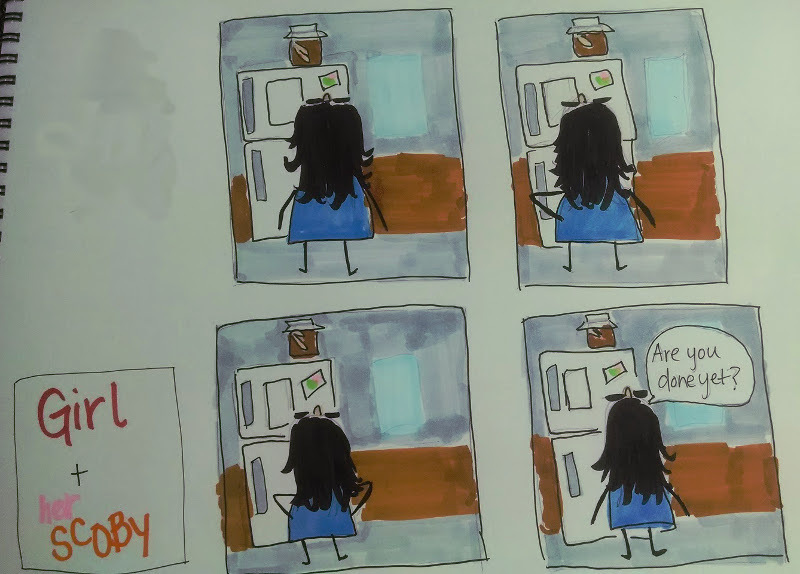 This is what I’ve chosen to do with the fancypants markers my family got me for Christmas… make poorly drawn comics about my semi-crunchy life. I like salad, I just don’t like it as a whole meal. With a build and appetite that would be kindly called “robust,” I’d have to eat a shocking number of raw leaves to feel satisfied. My “no salad as a meal” rule has a few notable exceptions: salads served in deep-fried taco shells, salads that have more croutons than vegetables, salads that are mostly grains, you get the gist. I found a new salad that’s a satisfying meal — Malaysian gado gado. The recipe’s from Ottolenghi’s Plenty. Well, I think it is. We moved to a new apartment, um, 3 months ago, and we just unpacked the cookbooks. Look, some of us struggle a little more than others. Um, and this photo is of reheated leftovers, because on the night we made it, I couldn’t wait to eat. Some of us have 101 cookbooks and photograph food beautifully. Some of us have 20ish cookbooks, never use them, and clearly eat leftovers while watching television on our laptops, visible in the photo. crispy fried stuff and satay sauce? sign me up for this salad. Okay, so even with all of my authenticity fail substitutions, the satay sauce was still delicious. And it’s British, so the measurements are in metric. I don’t really have a way of measuring mL in my brazenly American kitchen, but I did use my kitchen scale for the other stuff. First, whirl the garlic, sambal olek (sweet chili saucce), galangal/ginger, shallots, and lemongrass (if you’re using it) in the food processor until it makes a paste. Add a little oil if it’s looking more sticky than smooth. Toast in a saucepan with more oil. Ottolenghi suggests doing this for 40-50 minutes, but, I was hungry, so I did it for maybe 30 while I prepared the other stuff. Crush the peanuts in the food processor, and then add to a small pot with 450 mL water (about 2 cups). Simmer for 20-25 minutes. While your paste is toasting, bring a large pot of water to boil. I’m pretty sure Ottolenghi has a confusing metric measurement of how much, but just, a lot. Boil the green beans for 3-4 minutes, then fish out with a slotted spoon. Dunk in ice water if you’re fancy; I just rinsed them in the sink and called it a day. Dunk the cabbage in for a less than a minute if you’re using it; since I was using salad mix, I skipped this. Sprinkle turmeric in the water and boil the potatoes until they are done. The timing will depend on the size of the pieces. For me, this was about 15 minutes. At this point, the peanuts are simmered and the paste is toasted. Add the peanuts to the paste, and stir in coconut milk. Keep warm. Dredge sliced tofu in flour with a little salt and pepper and fry up the pieces. It’s worth the extra trouble, promise. 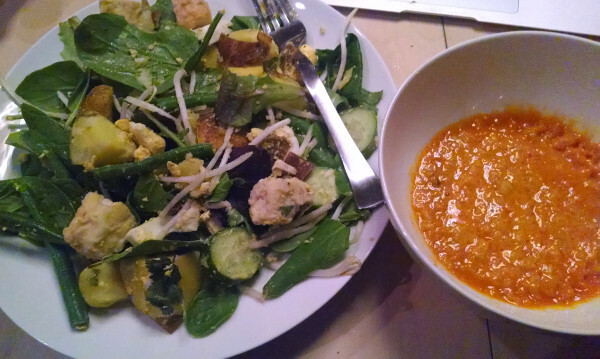 Assemble salad by placing greens, vegetables, and tofu in a large bowl. Serve with warm satay sauce. I attended a bread “skillshare” (kind of like a workshop, but slightly crunchier) over the weekend and thoroughly enjoyed myself, of course. Aside from being able to sample like ten different loaves of bread, I got to discuss my thoughts about gluten development, wild yeast, proofing, and Peter Reinhart for hours. And nobody rolled their eyes even once. I was in a carbohydrate utopia. 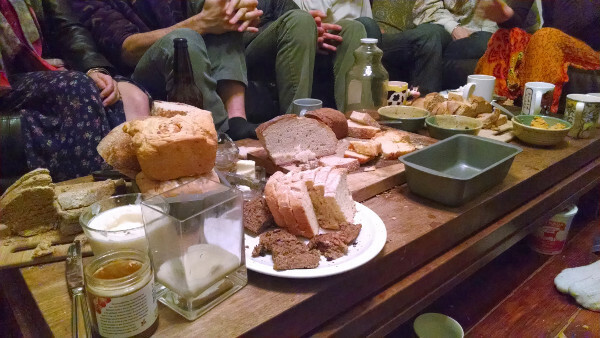 Seriously, look at all that beautiful bread and all those beautiful lower bodies. It is difficult to describe how satisfying this bread skillshare was. I learned that bread people talk with their hands, speak fondly of their sourdough starters, and think of recipes as mere “guides,” using all their senses to cook and bake. I’m a bread person, as it turns out. I combined sourdough starters with a fellow wild yeast wrangler to make a super starter, which is now living in our refrigerator. The hope is that the yeasts will breed strong, swift, Viking-like yeast who will rise breads with great effectiveness and speed. Yum. Results pending! Thank you very much for kindly welcoming me into your class and assuring me that I “didn’t need to worry if I wasn’t getting it initially” and that I’d “get it eventually” if I kept coming. Contrary to appearances, this wasn’t actually my first Zumba class, but let’s not revisit my previous blustering attempts back in the day. Why is Zumba held in a room that is covered in mirrors? While you were the perfect blend of athletic and sultry, my attempts called to mind descriptors more in the realm of “pudgy and robotic.” I would really much prefer to just look at you the entire time and delude myself that my movements resemble yours, instead of looking vaguely like an overweight chicken. Is it possible to turn the music down to a dull roar? I enjoy jamming out to Pitbull on full volume like any other human, but please, I get anxious that everyone on the block will hear and try to join the party, only to find my mockery of hip shaking and/or body rolls. What is your hair routine? Seriously, your hair looked really nice. I thought for a while about trying to strike a sophisticated, or at least, witty tone for the christening post of this not-so-new blog, but I couldn’t really come up with any inspiring messages. It’s okay; perhaps adulthood is just realizing who you are, even if that person is someone whose hobbies are like three clicks above playing with an Easy Bake Oven. 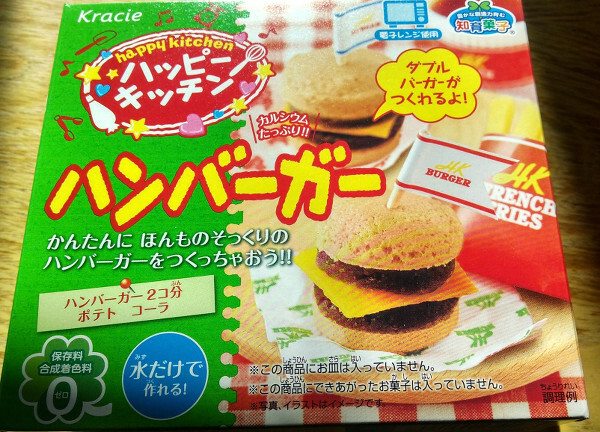 For the uninitiated, Japanese snacks sometimes come with a DIY element — most recently, completely engrossing tiny molecular gastronomy kits. Like, I’m 25, and my little sister is 16, and we’ve made 3 of these things and can’t stop won’t stop. The first one we did was the Poppin Cookin’ sushi kit, which yielded odd-tasting, amazing-looking gummy “sushi” with roe made using spherification. Anger Burger did a fantastic write-up on this kit that spurred the years-long hunt for these things for me. This time, we tackled the Happy Kitchen burger kit, which was supposed to yield 2 double-double burgers, a small bag of french fries, and a (comparatively) huge soda. I thought it would be candy, like those odd burger gummy things. Spoiler: it wasn’t candy. 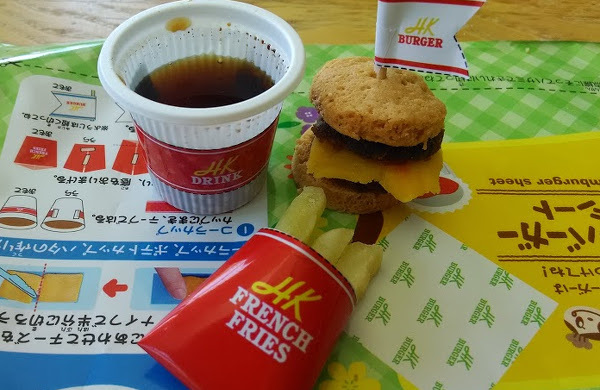 It was actually a couple tiny burgers, some tiny french fries, and flat soda, aka, brown sugar water. The way these kits work is, you have various bags of powder, a little water measuring scoop, and a panel of inscrutable instructions in Japanese of how to combine this and that and how long to microwave things. Though presumably this is a cakewalk for Japanese schoolchildren, for myself and my teenage sister, this was quite trying. 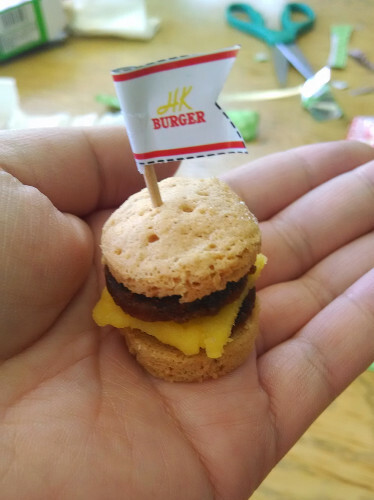 I watched a number of videos of small children making the kits to determine which powder was for the french fries and which powder was for the burger buns. Turns out I could have just smelled them, because the potato powder smelled tantalizingly like Pringles. Mmmm. The grossest and most fascinating part was most certainly the patty, which smelled like airplane breakfast sausage. Actually, it resembled airplane sausage in a lot of ways. The bun actually rose up really well in the microwave and tasted vaguely like bland cake, and the cheese was remarkably similar to American cheese. I sort of liked the french fries. I know. I’m ashamed of me, too. I can’t even. I mean. Look at this. It’s in my relatively normal-sized hand here, for scale.